We don't like being the bearer of bad news. We desire that all people live long, happy and healthy lives. But in an effort to protect anxiety disorder and depression sufferers, we believe it is our duty to bring awareness to important research that has potentially life altering consequences. This research certainly does. Because the long-term effects of these types of medications wasn’t known. 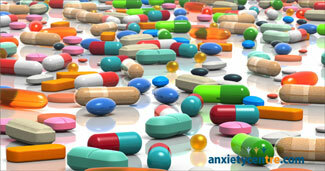 The “Chemical Imbalance theory” as a cause for anxiety disorder and depression was officially put to rest in 2011. And over the last 8 years, research has discovered many adverse effects associated with SSRI and SNRI usage, and it’s not good. The list of adverse effects is lengthy, and in some cases serious, including this latest research that has found antidepressant use significantly elevates risk of death. Anxiety and depression are caused by behavior, which can be changed with the right information, help, and support. SSRI and SNRI antidepressants were only used to manage symptoms. But with so many natural ways to reduce and eliminate anxiety and depression symptoms, these types of medications aren’t needed. So the risks associated with them aren’t warranted. If you are suffering with anxiety or depression symptoms, we encourage you to seek out and apply the natural strategies so that you can eliminate the many risks associated with SSRI and SNRI medication usage. Success can be attained through natural means. It is the safest approach to anxiety disorder and depression resolution. NOTE: Do NOT stop these types of medications abruptly. Talk with your pharmacist for correct discontinuation recommendations. HAMILTON, ON, CANADA, Sept. 14, 2017 - Antidepressant medications, most commonly prescribed to reduce depression and anxiety, increase the risk of death, according to new findings by a McMaster-led team of researchers. It's widely known that brain serotonin affects mood, and that most commonly used antidepressant treatment for depression blocks the absorption of serotonin by neurons. It is less widely known, though, that all the major organs of the body--the heart, kidneys, lungs, liver--use serotonin from the bloodstream. Antidepressants block the absorption of serotonin in these organs as well, and the researchers warn that antidepressants could increase the risk of death by preventing multiple organs from functioning properly. The researchers reviewed studies involving hundreds of thousands of people and found that antidepressant users had a 33% higher chance of death than non-users. Antidepressant users also had a 14% higher risk of cardiovascular events, such as strokes and heart attacks. The findings were published today in the journal Psychotherapy and Psychosomatics. "We are very concerned by these results. They suggest that we shouldn't be taking antidepressant drugs without understanding precisely how they interact with the body," says author Paul Andrews, an associate professor at McMaster University who led the research team. Taken by one in eight adult Americans, antidepressants are among the most frequently used medications. They are often prescribed by family doctors without a formal diagnosis of depression, on the assumption they are safe. Since depression itself can be deadly--people with depression are at an increased risk of suicide, stroke and heart attack--many physicians think that antidepressants could save lives by reducing depressive symptoms. However, McMaster researcher and co-author Marta Maslej, says, "Our findings are important because they undermine this assumption. I think people would be much less willing to take these drugs if they were aware how little is known about their impact outside of the brain, and that what we do know points to an increased risk of death." Benoit Mulsant, a psychiatrist at the University of Toronto who was also involved in the study, says the findings point to the need for more research on how antidepressants actually do work. "I prescribe antidepressants even though I do not know if they are more harmful than helpful in the long-term. I am worried that in some patients they could be, and psychiatrists in 50 years will wonder why we did not do more to find out," Mulsant says. Interestingly, the news about antidepressants is not all bad. The researchers found that antidepressants are not harmful for people with cardiovascular diseases such as heart disease and diabetes. This makes sense since these antidepressants have blood-thinning effects that are useful in treating such disorders. Unfortunately, this also means that for most people who are in otherwise good cardiovascular health, antidepressants tend to be harmful. anxietycentre.com: Information, support, and coaching/counseling/therapy for problematic anxiety and its sensations and symptoms, including the latest in anxiety research that found antidepressants significantly increase risk of death.